The Activity Preferences screen can be accessed from your Method dashboard by clicking the vertical ellipsis (⋮) on your Activities App and selecting Preferences. Do not send Emails when activities are assigned to me: If you create an activity and assign it to yourself, this checkbox will suppress the notification. Default Activity Type: The default type when you open the New activity screen. Default Activity Type for Calendar: The default activity type when you create an activity in the Calendar. Default Activity Status: The default status when you open the New activity screen. Default Follow-Up Type: The default type when you click “Schedule a follow-up”. Default Follow-Up Status: The default status when you click “Schedule a follow-up”. Default Follow-Up Days: How many days after the initial activity the default follow-up will take place. permissions, and affect the entire Method account. Activity Email Notification Template: The default email template sent out when an activity is assigned to a user. 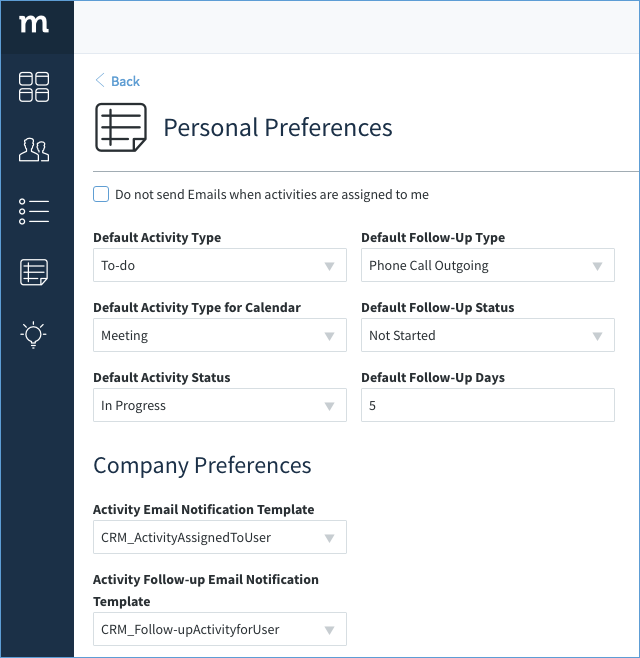 Activity Follow-Up Notification Template: The default email template sent out when a follow-up is assigned to a user. Click Save to save these changes.